UNITED NATIONS, June 17 -- With at least 400,000 ethnic Uzbeks fleeing violence, allegedly allowed by or participated in by Kyrgyz government forces, the UN has yet to call on Uzbekistan's Islam Karimov to open the border to those flees, and the UN still blithely deals only or primarily with the Kyrgyz interim government of Roza Otunbayeva, a former UN staffer. Meanwhile, when asked by Inner City Press about Karimov's border closing and his crackdown in Andijan, which caused some of the Uzbeks to flee to Osh in Kyrgyzstan, UN Spokesman Martin Nesirky called that historic human rights background "secondary." One wonders with the UN in fact has learned. Or the International Monetary Fund. On June 17, IMF spokesperson Caroline Atkinson after by rote calling "the violence... deplorable," said that while the IMF's Exogenous Shock Facility expired last week, the IMF is part of a donor mission, and would like to convene a donor's conference. For the government? Inner City Press: On Kyrgyzstan, there are these reports of ethnic Uzbeks saying that there were attacked by, at a minimum, people in Kyrgyz army uniforms riding on Kyrgyz army tanks. And being on the tank seems to say that’s a soldier unless there is somebody keen and somehow commandeered the tank. 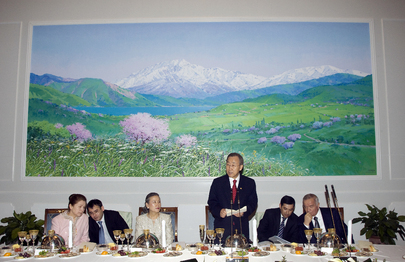 I wonder when, in the Secretary-General’s communications with the Government of Kyrgyzstan, does he have any concerns? How is the UN going to look into the allegations that, in fact, the Government and its forces may be responsible for some of the killing of ethnic Uzbeks? 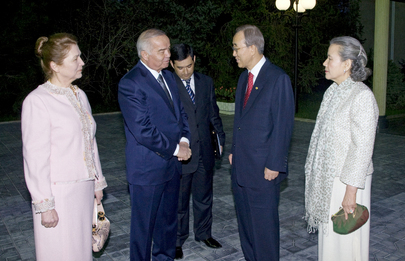 And in his conversation with [President] Islam Karimov of Uzbekistan, did Ban Ki-moon ask that the border be opened? What about these 300,000 internally displaced people? Do they have a right to cross the border if they feel they’re under fear or must they remain in Kyrgyzstan under this threat? Spokesperson: On the first point, clearly the Secretary-General has been speaking to a wide range of people. You already know that that he spoke to Ms. [Roza] Otunbaeva, who is chairing the Interim Government. And he has expressed his concern quite publicly and clearly about the need for restraint on all sides, and ensure that there is an end to the violence. The specific case that you’re referring to, we’re aware of various reports of what may or may not have happened in Osh, in Jalalabad and other places. And that will take some untangling, I think, to fully understand precisely what has happened. And we have Miroslav Jenc(a on the ground there, and he obviously will be seeking to find out more details of precisely this kind of thing. But the key point has to be that there needs to be restraint on all sides, and vulnerable people need to be protected and not placed under further threat in the way that you’re suggesting. 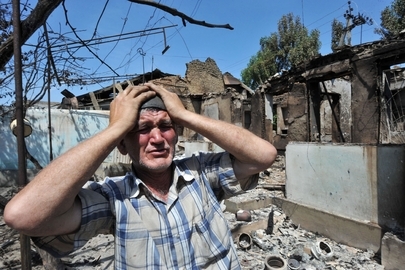 The second point about displaced people, internally displaced people, ethnic Uzbeks and others too, the Secretary-General, in his telephone conversation with President Karimov of Uzbekistan, was appreciative of the Uzbek Government’s approach in allowing refugees to cross into Uzbekistan and also then to take care of them with the limited resources that they have. And he was also appreciative, and remains appreciative, that the Uzbek authorities are liaising with UN agencies to ensure that aid can be brought in to supplement the limited supplies that they themselves have in that particular area. Inner City Press: Some have raised the concern that some of the ethnic Uzbeks in and around Osh were actually people that fled after the Andijan, what’s called the massacre, earlier carried out by the Uzbek Government, and that that may be one of the reasons that they closed the border, they did not allow them back in. Is that something that the Secretary-General, he is aware of the Andijan, I am sure, but what role does that play in this cross-border? Spokesperson: Well, I think you’d have to ask the Uzbeks what role that plays. Our primary concern is, regardless of where people have come from, if they are in need, they should be helped. And if people have fled their homes, however long they have been in those homes and wherever they originated from, they need help. If people are desperate because they feel that they’re under threat, then they need assistance. And it’s secondary, I think, at this moment to address the kind of points that you’ve mentioned. Great idea -- leave WHY it happened until later, when it will be forgotten. Watch this site. In Wake of Ethnic Cleansing, Dubious Kyrgyz Referendum Supported by UN -- and U.S.? UNITED NATIONS, June 16 -- Despite over 100,000 ethnic Uzbeks having been forced by violence out of Kyrgyzstan, the UN's man in Turkmenistan Miroslav Jenca has said the UN supports still holding the country's post-coup referendum on June 27. Inner City Press: with this number of people displaced and shooting still going on, what would the UN say to those who say that an ethnic minority that’s being targeted here won’t be able to vote in the referendum, thereby rendering it less than legitimate? Associate Spokesperson: As far as that goes, yes, Mr. Jenca does believe that the referendum needs to go ahead. Our Electoral Affairs Division also is supportive of this. We realize the challenges, given the level of displacement, but the Electoral Division is in touch with the relevant electoral bodies in Kyrgyzstan and we’re trying to see what alternatives can be done to make sure that people exercise their right to vote. Inner City Press: Do you believe that the 100,000 Kyrgyz citizens now in Uzbekistani camps should be allowed to vote in the election? Associate Spokesperson: We believe that all steps should be taken to make sure that all of the Kyrgyz population can vote. The question, you’re right, there is a very strong logistical challenge at this stage, and we’ll have to see how that can be resolved. But our electoral people are in touch with the relevant authorities in Kyrgyzstan on this. Inner City Press: Mr. Jenca, from his statement that it must go forward, it seems like he thought that it’s been resolved, or is he saying that it should go forward if it’s resolved or…? Associate Spokesperson: He believes that, at this current stage, there is a series of options, all which have their difficulties and their problems. And the best way forward is to continue with the referendum, and try to address all the various challenges that have been caused by this displacement. The referendum would install Roza Otunbayeva -- a former UN staffer -- in power through 2011, and approve Constitutional changes. To do so weeks after ethnic cleansing raises questions. What is the position of the United States, whose Robert Blake is headed to Bishkek this week? As Uzbeks call it ethnic cleansing or "attempted genocide," what does the US war crimes off, or Samantha Power, have to say? Inner City Press: on this readout of the Secretary-General’s call with Islam Karimov of Uzbekistan. Am I misreading it? Did he ask that the border be opened so that people there that still are facing violence are able to cross or did he not? Associate Spokesperson: Just to read back the readout, which we just got, he said that he highly appreciated Uzbekistan’s constructive efforts in addressing the alarming humanitarian situation in Kyrgyzstan, particularly in opening the border for refugees and providing for their care despite limited resources. Inner City Press: Why did they report that it was open at first and then it was closed? Is it open or closed? Associate Spokesperson: As we’ve said in the last couple of days, there were contradictory reports on this. We’ve been getting information on UNHCR, and like I said, the Secretary-General just earlier today spoke with President Karimov and this is the readout that I have. Question: [inaudible] what about this report that this crisis was deliberately triggered off, that report by the United Nations? Associate Spokesperson: This is from comments that were made by my counterpart at the Office of the High Commissioner for Human Rights, Rupert Colville. I’d just refer you back to Mr. Colville’s remarks, where he talked about identifying five specific incidents of attacks a few days ago. And that’s part of the public record that we have in our briefing notes from there. How can the UN say that an attempted genocide or ethnic cleansing was planned, without saying who planned it? Watch this site.